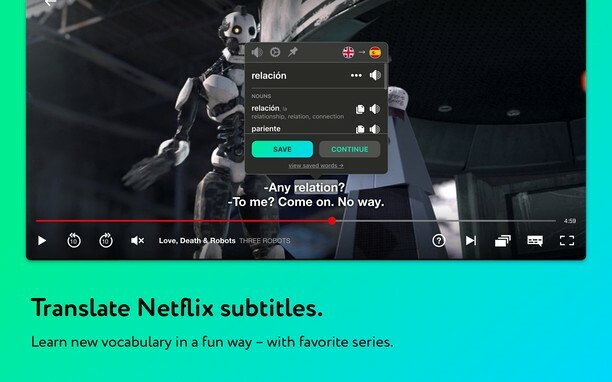 Just like a real-life mate has your back, Mate Translate Extension for Opera has you covered for all your translation needs. 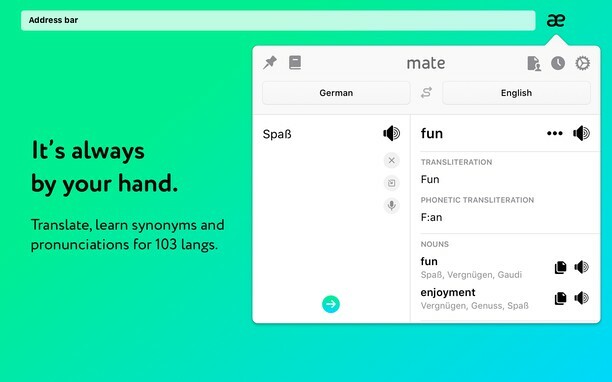 Mate helps you easily and effortlessly translate words, phrases and documents from 103 languages. Mate’s comprehensive dictionary and custom curated phrasebook will help you accelerate your language learning with both page translation and optional human translation. Mate isn’t just for reading and writing but for full language mastery and comprehension. Download your Mate Opera translator today and never feel lost in language again. The Mate Translate Opera Extension allows you to highlight any word or text on a webpage and instantly translate it by pressing the shortcut or double-clicking with your mouse. Using the shortcuts will create a small unobtrusive pop-up screen with your direct translation highlighted right there in front of you. No need to click to a new screen or browser window. Mate’s translation with a click feature ensures you never need to leave the page you’re on or interrupt your work flow. Mate saves you time and keeps you on track. Mate has an incredibly comprehensive instant translation database of 103 languages. No matter what language you need help with, Mate has your back. Mate provides phonetic transcription of any translated word in any language into the international phonetic alphabet. That means you can enter a Chinese character and Mate will tell you how to pronounce it and even transcript it phonetically. Mate doesn’t just help you read in your target language, it teaches you how to speak and understand it. Download today and view our expansive 103 language list. Mate stores all your translations offline so that you can reference them whenever you want. You can install Mate on a variety of devices and Mate will synchronize between all of them. Mate allows you to instantly translate a phrase on your Mac and then you can access it on another desktop or mobile device. Never lose a translation again, even between devices! Mate’s Phrasebook functionality allows you to curate personal phrasebooks that you can access quickly and easily on any device. Language learners love using phrasebook to create custom lists for classes or common situations they find themselves in. Instead of creating bulky flashcards just create a Mate Phrasebook word list and study on any device no matter where you are. Phrasebook is also perfect for travelers. Never forget how to say or pronounce, "where is the bathroom?" or "what’s your number?" in any language ever again. Your Phrasebook synchronizes across all your Mate devices, and can be curated offline too. The app was working really nice first day, but after that it doesnt work. When i try to translate anything it jsut says "Loading" but forever. I like your very clean interface so after trying most of the translators I decided yours was the one most worthwhile to ask these question of, especially question #2 since I was unable to find any translators that were able to accomplish the task mentioned for question #2. 1) If I copy sentences into the "Instant Translate" interface the "translate" function (button) at the bottom of the source window (automatic detection) does not display (is not triggered) unless I change something after the paste i.e. add or subtract or type a character at which time then the "translate" function is then available. I think you're triggering the button when a keystroke is made in the source box and a paste isn't doing this presumably (but then if I delete a character it triggers it too so it's more than just a keystroke issue I guess). Anyway the "translate" function should either always be available or if not triggered if any change occurs including pasting into the source box. 2) The right-click context menu after making a selection on a page to translate works in most cases (tested on forum input) but does not work for "Feedback from users" entries for Opera add-ons. If I select a posted comment and click on this add-ons context menu translate option nothing happens. This is very important because there is a great need to translate Feedback comments and I have not found a Opera translator that is capable of doing this (like the translator I have in Firefox that can do this). 3) Would you consider a "Clear" button on the "Instant Translation" interface as the last translation remains which has to be selected and deleted to clear the last translation. 1) You described the behaviour with enabled smart translation (i.e. when it should after typing end)? In regards to point #2 as far as what you posted quote: "On the other hand, by me, it works here in the Opera Add-ons Feedback section...", that is interesting that the "feedback section" does work for you because if I select for example the recent post by drakas322 then right-click and select "Automatic detection into English" from the context menu nothing happens for me (but doing this in other forums does work so I know the context menu function does work). In regards to point #1 (which is less important and does have a "workaround"), I'm not sure about your explanation, but to explain what I'm saying in a different way. If when using the "Instant Translation" interface (window) and "translate..." is at the top of the "automatic detection" source (left) pane at which time I place the cursor in front of "translate..." and paste what I've copied into the left source pane then the "Translate" function (button so to speak) disappears (does not display at the bottom of the left pane). If I either hit the space bar once before pasting or if I hit the space bar after pasting then the "Translate" will display at the bottom of the source (left) pane. This is fine all I have to do is remember to add the space before or after pasting into the source pane to avoid the "Translate" function disappearing so no big deal. OK, point #1 is solved (v2.9.40), just clicking on the squiggly icon between source and target boxes above translations gets what I want (translates what I've pasted into source avoiding all issues I referenced previously). Also by setting "Save value" to disabled the entries are cleared upon closing the translation interface so this also solves the "clear" question I mentioned. All is SUPER FINE now!!!! (well actually except for point #2 mentioned above, still not getting the translation as mentioned above like you report that your getting from the right-click context menu for comments in this blog). But still good enough to deserve the 5-star rating I'll now give for the extension. Regarding Opera Add-ons: I just figured out that Opera does not allow extensions to inject content scripts on the pages of Opera Add-ons, likewise Google does not allow to do so on pages of their Chrome Web Store. *Content scripts are indispensably necessary for tooltip translations. The hot-fix (v2.9.38) was just released and will be automatically delivered to you within a few hours. Sorry for the inconveniences! Не работает! Заканчиваю предложение и ничего не происходит! Not working! Finish writing the proposal and nothing happens!